Keith Lowry of Graves County Named 2015 Kentucky Farm Bureau "Farmer of the Year." Louisville, KY (December 4, 2015) – Vincent “Keith” Lowry of Graves County was honored as the 2015 Kentucky Farm Bureau (KFB) “Farmer of the Year” during the organization’s 96th annual meeting in Louisville. 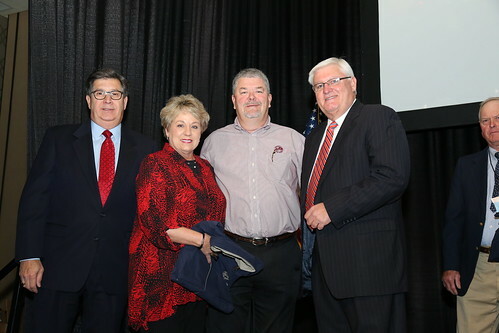 Keith Lowry (right center) and his wife, Rita (left center), received the 2015 “Farmer of the Year” Award at Kentucky Farm Bureau’s annual meeting in Louisville. Presenting the award is David S. Beck, KFB Executive Vice President (left) and Mark Haney, KFB President (right). Lowry began his career in farming in 1976 with 200 acres of cropland and a tobacco crop. That operation has grown considerably over the past 39 years and today includes 2,400 acres of wheat, half of which is grown for seed; 3,400 acres of corn, which is marketed to two poultry operations; and 3,400 acres of soybeans grown for seed production. In addition to the crops, Lowry Farms has a fleet of eight trucks that haul fertilizer and seed beans, along with an excavating business. Lowry’s operation is currently 85 percent no-till but he hopes to raise that to 100 percent. He also plans to expand the grain handling facility to better market the crops and continue his work in seed production. Lowry has spent 21 years as a director with the Graves County Farm Bureau, 11 years as its secretary/treasurer, and attended the Washington, D.C. trip in 2013. His community service activities have been extensive, as well having served as a mentor at Graves County High School from 2010-2014, being awarded the Graves County School Friends of Education Award in 2014, received the Rotary Humanitarian Award in 2014, named Master Conservationist in 2002 and has serves as Graves County Conservation District Board Chairman for 11 years. After spending 29 years as an agriculture educator, Bays retired seven years ago to pursue his passion of becoming a full-time farmer. In doing so, he and his wife Anne have turned their Moonlight Farm into one of the most productive and efficient operations in the region. The Bays farm consists of commercial cattle, grass-fed Scottish Highland cattle, Red Waddle hogs, quarter horses and free-range poultry along with grass and legume hay. The Highland cattle are born on the farm and raised there until processed for beef. The individual beef cuts are then sold at farmers’ markets and in CSA packages. The commercial cattle are marketed as feeders at 500lbs. The majority of both the Highland and commercial heifers are retained for breeding purposes. In addition to the beef products sold at farmers’ markets, Bays sells pork, chicken and eggs at those venues, as well. Bays has also worked to maintain the soil health of the farm by incorporating legumes along with several forage species to rebuild soil fertility. He hopes to build new barns for hay and equipment storage, continue to improve forages and expand meat sales to the Internet. Bays has been a member of the Knox County Farm Bureau for more than 15 years, a state convention delegate for 3-plus years, secretary/treasurer of Knox County Farm Bureau and currently serves as vice-president. He has also worked with many leadership events and local ag day events. Over the past 39 years, Bach’s farming operation has more than doubled to reach the 1,000-plus acres it is today. The operation consists of hay and corn silage to go along with the 170 beef cattle, cow/calf herd. Bach markets the hay and silage through the cow/calf operation and markets his calves in a number of ways including through direct feedlot sales and truck loads through local stockyards. Bach also sells bred heifers, which meet all state requirements for bred heifer sales, as replacements. In addition, Bach and his wife Mary raise fruits and vegetables, namely peaches and asparagus. Through selling these items at farmers’ markets, he has been able to better educate consumers about food production. Bach doesn’t have any immediate plans to expand the farming operation, which has been a no-till farm for 15 years, but would like to see his son Steven, who has a nearby grain operation, continue the family tradition. Bach is very active in community and church activities. He has served as the president of the Kentucky Cattlemen’s Association; serves as the Bath County Extension Foundation Board Vice-President; has been on the Bath County Farm Bureau Board for more than 20 years; serves on the Kentucky Farm Bureau Forage Advisory Committee; serves on the Bath County Farm Bureau Executive Committee; and is a State 4-H Foundation Board member. Bach was also instrumental in getting the Agricultural Marketing Center in Bath County established and was recently elected to the Bath County Agricultural Hall of Fame. Judges met in mid-October to conduct interviews with the finalists and visit the farms. The “Farmer of the Year” recipient will be announced at KFB’s 2015 state annual meeting in Louisville on December 4 and will receive $1,000 from the Kentucky Farm Bureau Federation. All three finalists will be given a KFB jacket, and the runners up will each receive $250 from the Kentucky Farm Bureau Federation. In addition to the statewide recognition and prizes, KFB’s “Farmer of the Year” winner will represent Kentucky in the Swisher Sweets/Sunbelt Ag Expo Southeastern “Farmer of the Year” contest, the South’s most prestigious agricultural award, in Moultrie, Georgia, October 18-20, 2016. Last year’s winner received a $15,000 cash award plus $2,500 as a state winner from Swisher International, the use of a Massey Ferguson tractor for a year from Massey Ferguson North America, a $500 gift certificate from the Southern States cooperative, the choice of either $1,000 in cottonseed or a $500 donation to a designated charity from PhytoGen, and a Columbia jacket from Ivey’s Outdoor and Farm Supply.